Recent scientific study verifies what many Native people have always known, that traumatic events in our ancestors lives are in our bodies, blood and bones. These events leave molecular scars adhering to our DNA. Our grandmother’s tragic childhood can trigger depression or anxiety in us, but we have the ability to heal these DNA encodings and change that trait for future generations. For people of the Black African diaspora, too, these words from Minneapolis-based dance artist Rosy Simas (Seneca, Heron Clan) ring true, and I must begin with gratitude to Simas for work that illustrates the body as truth-teller and healer. We, too, are a people nurtured by connection to ancestors with tragic histories in this hemisphere, and many of us express reverence for ancestral heritage through powerful spiritual and artistic practices that are, in their way, forms of anti-colonial resistance and justice-making. Simas's 50-minute solo, We Wait In The Darkness--with its soundscape by composer François Richomme--uses visual, textual, kinetic and sonic mediums to affirm and reclaim the strength of ancestry and environment. By employing this sensory overlapping and overload, viewers grasp what it must be like to uncover the memories one's body holds--some sweet, some painful, some subtle or slow to emerge, some earthshaking--and to tap its wisdom. Over one end of the stage hangs Simas's long, white paper model of a DNA strand. Towards the center back a white, puff-sleeved dress with a long, old-fashioned dirndl skirt dangles. Along stage left, Simas has suspended a series of white paper panels textured like fine quilts. Panels also capture film imagery, often hazy, glimmering and ethereal, that allude to place--and sometimes people--without specific identification for the benefit of those outside Seneca culture. This poetically elusive quality renders the work as ritual rather than documentary, gives it a spaciousness rather than containing it as the story of a particular individual--although we do hear a voiceover of actual letters of Simas's grandmother, as read by her mother, and we also hear words in the Seneca language gruffly whispered as Simas dances. So, precious, protected mystery exists but also a certain porosity and generosity to help all of us begin to understand the possibility and path of healing. Theater of both the vivid and the indistinct, then. As Simas sits with her naked back to the audience--spine and arms deeply flexing, stretching and reaching, snaking and twisting--I recall my first realization, when I practiced energy healing, that the back shares more information, without a person's conscious intervention and manipulation, than the front of the body. 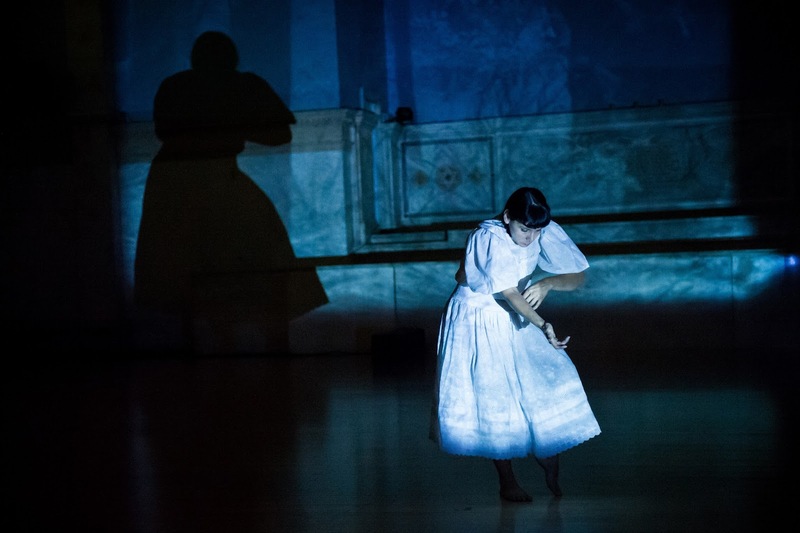 Throughout the dance, even when she finally dons that white dress, Simas shows us a body of focused, determined will, sure of itself, sure of its mission, sure of the ultimate fulfillment of that mission. We come to understand the evocative sound and visual imagery--drawn from earth and waterways of Seneca land--as its sacred source. And we also contemplate what it meant, for indigenous people, to be literally torn from that grounding, nourishing source. Her body speaks as it moves, and it is saying: I will this. I call this back. The spirits of the land respond in Richomme's mesmerizing, commanding weave of sound. Near the end of the piece, projections of schematic diagrams suggest maps with numbered sections, a landscape reduced to arbitrary parts for some entity's benefit. Again, nothing is identified, verbally or visually, yet the implications are clear. An environment we just experienced so powerfully in sight and sound, now lies butchered. Simas brings out a sheet of white paper marked with this diagram, solemnly ripping each section from its matrix and placing each strip in a carefully-chosen position along the edge of the floor. She also rips away more of these sections before descending into the audience and gifting them to several of us. I received number 12. Although I have no idea what territory--real or metaphoric--that it might represent, I will preserve and treasure it. Closed. American Realness 2018 concludes this evening. For further information, click here.